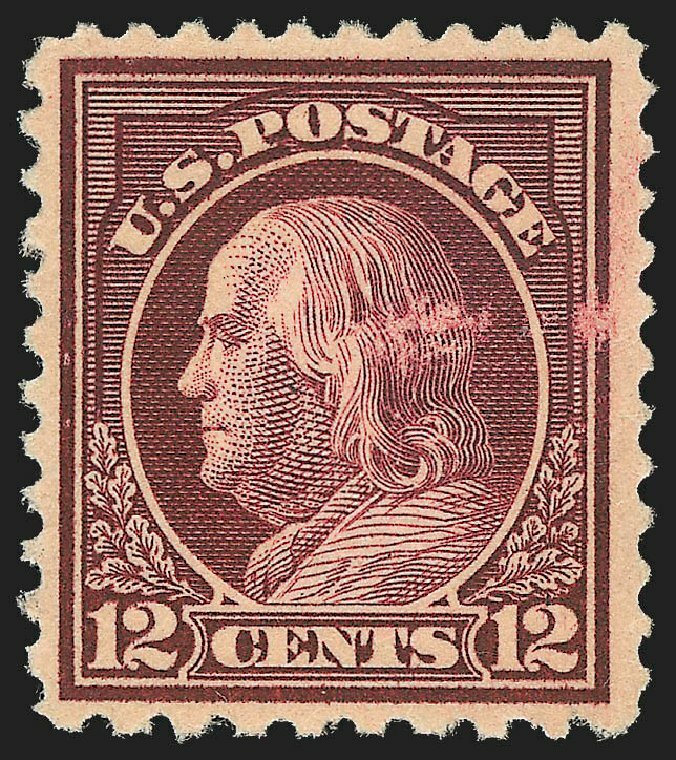 1917, 12¢ claret brown. 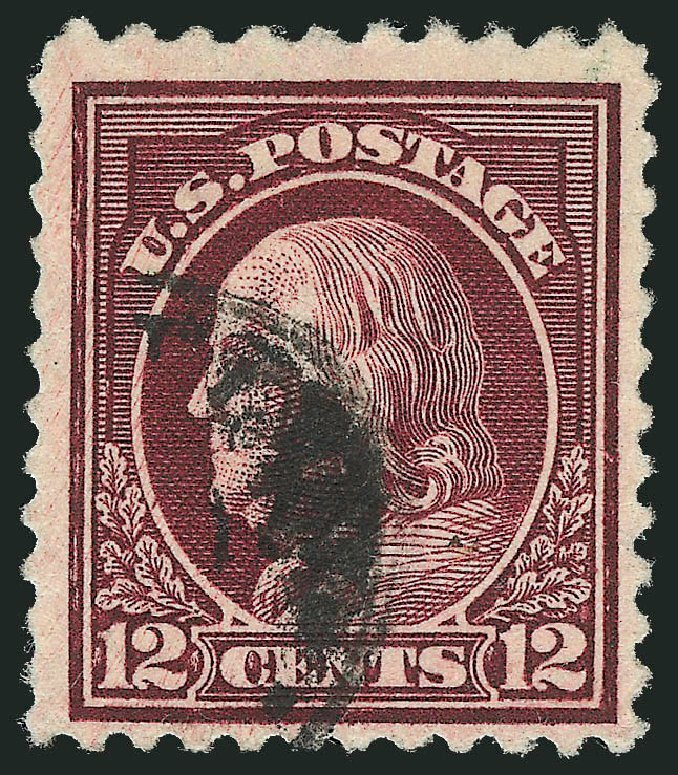 Bottom margin plate number “6913” single (trivial crease in selvage), o.g., never hinged, huge margins and exceptional centering, marvelous deep color, an Extremely Fine jumbo, a stunning stamp, with 2006 P.S.E. Graded certificate (XF 90J, SMQ price $50 for 90 and $150 for 95). Scott No. 512; $18. 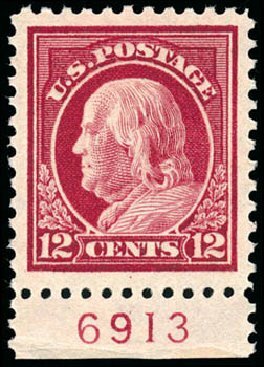 1917, 12¢ claret brown. Top margin plate “15584” block of 6, o.g., never hinged, attractively centered, deep color and very fresh, Very Fine, with 2006 P.F. certificate. Scott No. 512; $260. 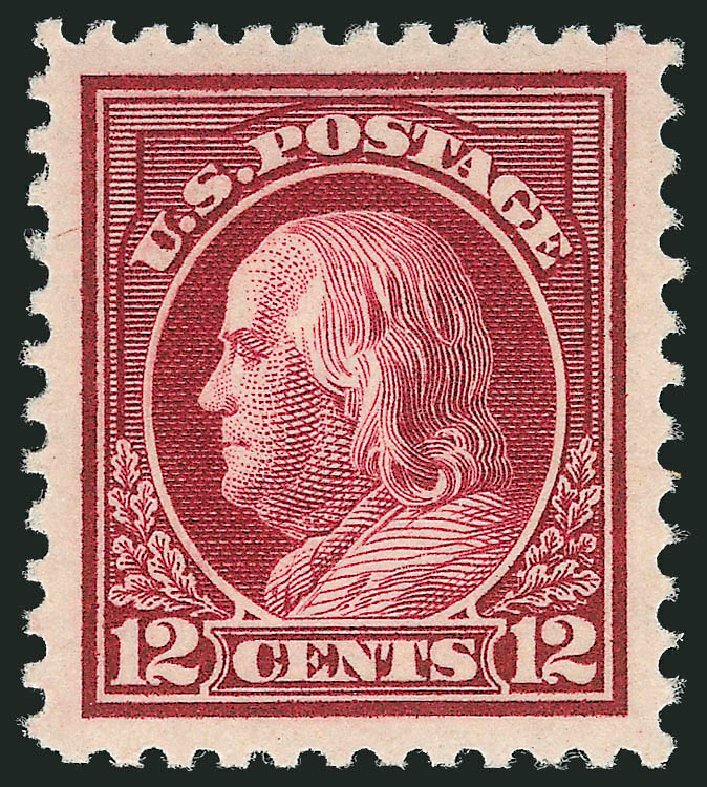 1917, 12¢ brown carmine. Top margin plate “6931” block of 6, o.g., top center stamp lightly hinged, others never hinged, intensely rich color on bright paper, wide margins, Very Fine and choice. Scott No. 512a; $150. 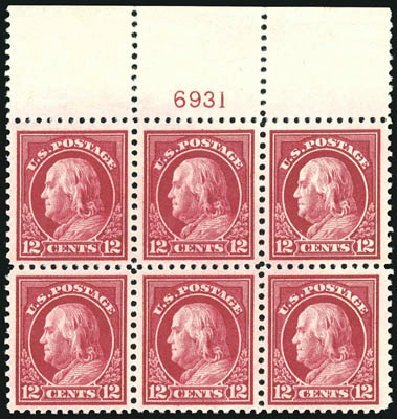 o 1917, 12¢ claret brown, perf 10 at bottom (512b), transitional perfs from perf 10 at right to perf 11 at left, rich color. “Reading Pa” pre-cancel. Small faults including nicks at upper right and bottom left. Otherwise Fine. Scott $15,000 A REASONABLY ATTRACTIVE EXAMPLE OF THE RARE 12¢ PERF 10 AT TOP OR BOTTOM— LESS THAN 20 KNOWN. Expertization: 2015 P.F. Certificate. 12c Claret Brown, Perf 10 at Top (512b). Bold cancel, deep rich color, small thin spot at top, small diagonal crease at bottom left VERY FINE APPEARANCE. A RARE EXAMPLE OF THE 1917 12-CENT PERF 10 AT TOP. ONLY TWELVE USED EXAMPLES ARE KNOWN, AND THIS IS ONE OF ONLY FIVE EXAMPLES WITH A REGULAR CANCEL. A GREAT RARITY. At a certain point during production one of the perforating wheels became defective. In the course of repairs part of one perforation wheel was inadvertently changed from Perf 11 to Perf 10. Based on the physical evidence of surviving copies, this was the nineteenth row of pins on the wheel. Many examples of the Perf 10 on One Side rarities show transitional perfs from 10 to 11 or from 11 to 10. 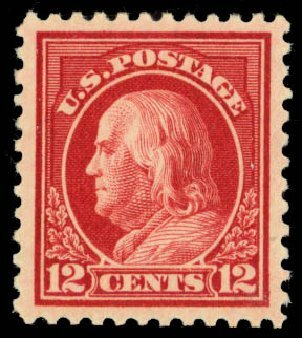 This is because the out-of-gauge perforation pins would frequently cross the span of more than one stamp, depending on where the wheel contacted the sheet. 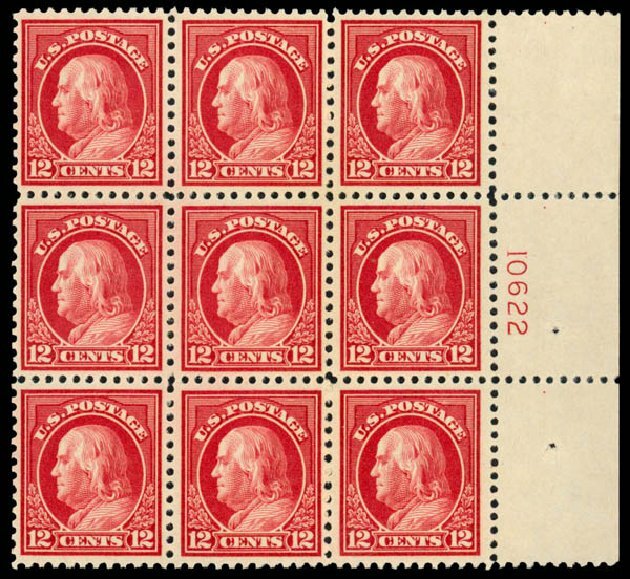 The Perf 10 on One Side varieties span both the 1917 Washington-Franklin and 1922-23 Issues. It is interesting to note that, apart from the 2c, there is no duplication of denomination between the issues. This would seem to indicate that the improperly repaired wheel was in use for only a short period of time, as there was little overlap in production of the issues. Based on dates of issue of the basic stamps, this probably occurred early in 1923. Our census of Scott 512b, available at our website at http://siegelauctions.com/dynamic/census/512b/512b.pdf , contains only twelve used and four unused examples of this rarity. For some reason none is well-centered. Seven of the twelve used examples have precancels. Only one of the five with regular cancel is confirmed as sound (no. 8), but it is off-center in two directions. Two others (nos. 2 and 3) need to be reexamined as they have very old certificates — one is from around 1950. The example offered here has margins wider than most and should be considered a very desirable example of this rarity. Census No. 512b-CAN-01. Ex Schilling, Zoellner, Blumenkopf and Natalee Grace. With 1950 and 1998 P.F. certificates. 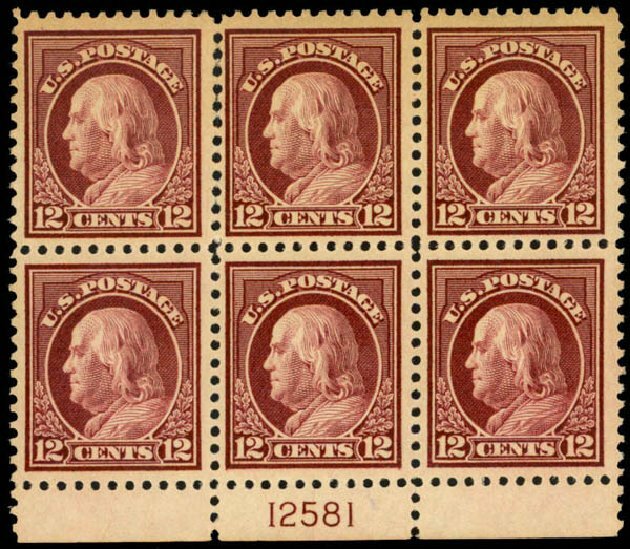 1917, 12¢ claret brown (Scott 512), top plate block of 6, o.g., never hinged, handsome with top with an incredible depth of color, Fine. Scott $260. Estimate $150 – 200. 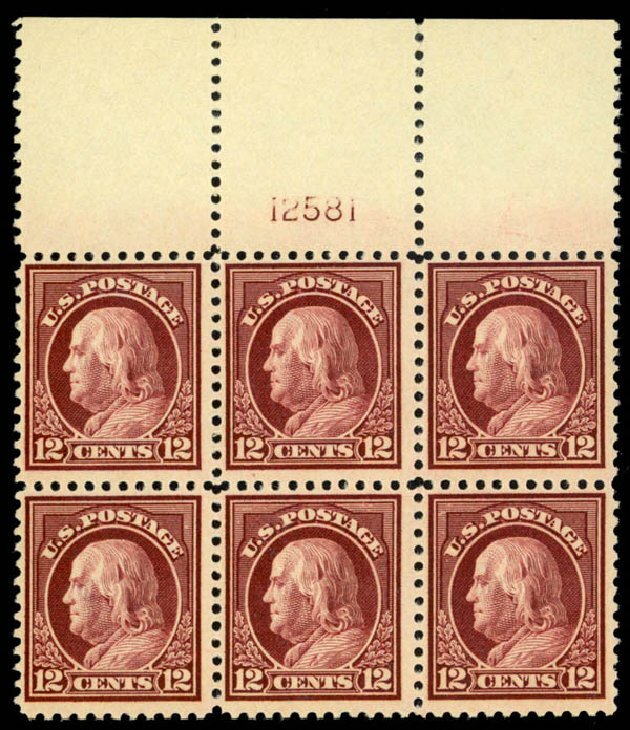 1917, 12¢ brown carmine (Scott 512a), right plate block of 9, o.g., never hinged, a most impressive top quality multiple of this distinctly different brown carmine shade, with breathtaking color and clear impression, Very Fine. Scott $314 as PB and 3 singles. Estimate value $250 – 350. 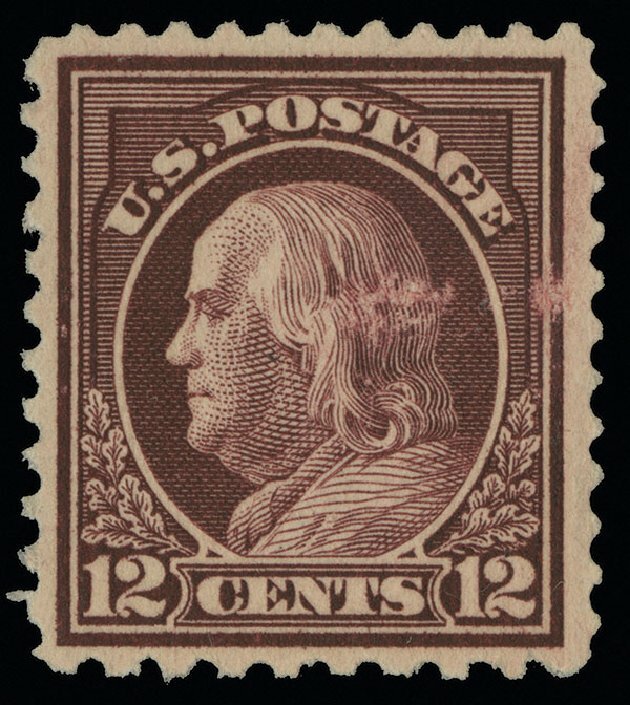 1917, 12¢ brown carmine (Scott 512a), o.g., never hinged, fabulous example of the brown carmine color shade, an extraordinary well centered stamp with wide margins and dazzling color; as this color variety in unlisted in SMQ buying guide, we feel our estimated value of $200-300 for this gorgeous stamp is a fair estimate, Extremely Fine to Superb, 2009 P.S.E. certificate graded XF-SUP-95 (1 of 16 at this grade, with 12 others grading higher). Scott $18. Estimate price $200 – 300. Scott #512b, 12c Claret brown, perforated 10 at bottom variety, an amazing mint example of this enormously rare stamp, possessing the best centering of the known mint examples, large and balanced margins, fully intact perforations, o.g., l.h., light facial scuff affecting the color only, otherwise very fine; accompanied by a photocopy of 1980 PF certificate for a block of four, this being the top right stamp.The certificate is important for establishing the census of the mint examples of this rarity as Apparently the nature of this error was not known at the time the certificate was issued. It has this unusual description: “Block o 4, right vertical pair perf.9½ between, left vertical pair perf. 10 between”. The reason for this unusual description is the perf. 10 is perf. 10-81on the Kiusalas gauge, which is close to perf. 9½. Furthermore the left pair is only partially perforated 10. The left five holes are the normal perf. 11 and the right five holes are perf. 10. Not recognizing this when they tried to gauge the left pair they saw that it gauged differently overall than the right pair and thus their description. But this block also establishes that each of these four stamps is a different variety. The top right stamp (the stamp offered here) is perf. 10 at bottom, The bottom right stamp is perf. 10 at top (offered in 2011 as n.h. by Siegel Auction Galleries) and the top left and bottom left are partially perf. 10 at bottom and top respectively. Current census of 512b shows twelve used stamps. The number of mint known are only four, all of which are substantially different varieties. 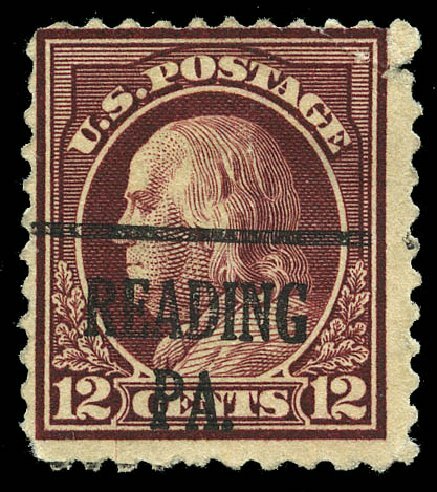 The stamp offered here is a great rarity for the Washington-Franklin specialist. 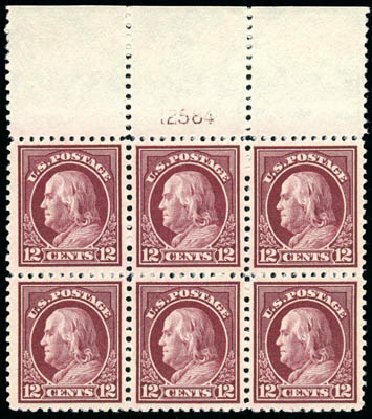 1917, 12¢ claret brown (Scott 512), left plate block of 6, o.g., never hinged, nicely centered wide side plate, immaculate mint condition without a single skip or bend, Very Fine. Scott $260. Estimate price $200 – 300. 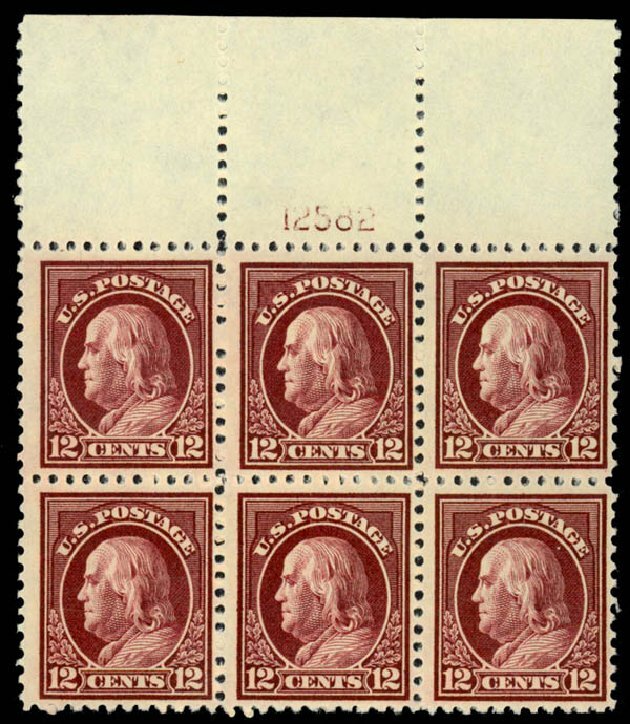 1917, 12¢ claret brown (Scott 512), bottom plate block of 6, o.g., never hinged, well centered with large margins and rich color, Very Fine. Scott $260. Estimate price $150 – 200. 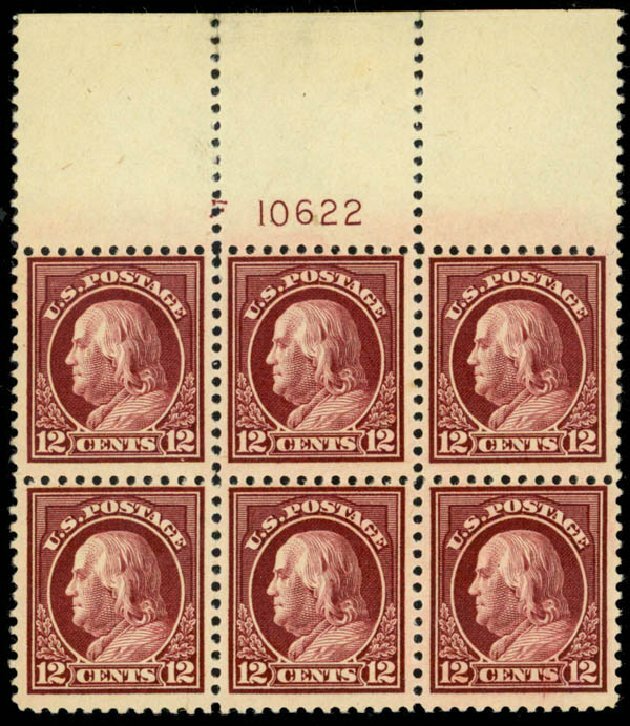 1917, 12¢ claret brown (Scott 512), top plate block of 6, o.g., never hinged, impressive full wide top, with brilliant fresh color, looks like it was just issued yesterday, Fine. Scott $260. Estimate $150 – 200. 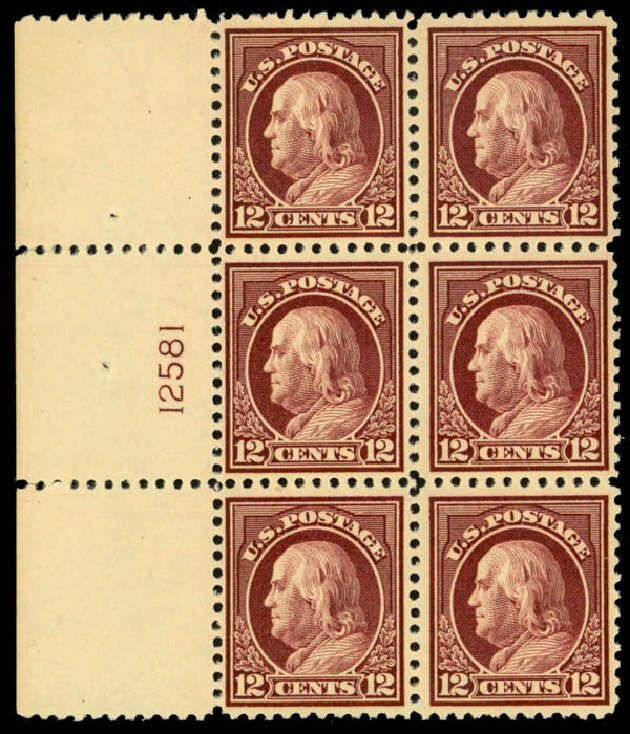 1917, 12¢ claret brown (Scott 512), top plate block of 6, o.g., never hinged, extremely fresh and attractive wide selvage, Fine. Scott $260. Estimate $150 – 200.